True repentance involves awareness, humility and a broken and contrite heart. In pride and arrogance King David sinned against God and his people. Only when confronted by the prophet Nathan did he realize his need to repent. Like King David, we can become blind to our sins and fall into darkness that hurts us and the ones we love. Once spiritually aware of his wrongdoing, King David became broken and laid himself bare to the world. He was not trying to fake repentance with God — he knew tears alone would not suffice; his tear-drenched pillow did nothing to relieve his guilt. Then he acknowledged his sins to both Nathan and to God. Likewise for us, only with awareness and a genuine change of heart can we be healed. While tears can flow out of self-pity, regret and even remorse over what we’ve done, without Godly sorrow there is no repentance. A person can even feel sad about hurting his spouse or friend. Yet without genuine repentance, there is no healing. A person can conceal their sins and continue in darkness without changing the true nature of the problem. 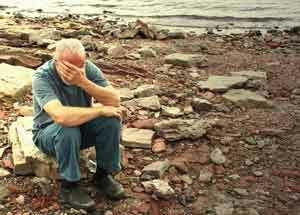 Godly sorrow leads to repentance, transformation and renewal (2 Cor 7:10). This is true repentance. It flows from the heart of God through our desire for change. This comes from a broken heart motivated to face one’s pride, sin and hurtful actions toward God, self and others. With courage and wise counsel, we can break the chains, learn to love ourselves and others in the way God intends. This means owning our sins, making amends, and changing the heart and mind patterns that cause harmful behaviors in the first place. This is not easy. Genuine repentance requires courage, humility and time to face one’s deepest sin and shame. As long as one nurtures denial, he also harbors a safe port for wrongdoing. In John 1:9 and James 5:16 we are told to confess our sins to one another and God will forgive us and remove all unrighteousness. Only then can we be healed. Confession and repentance take courage and a willingness to be absolutely honest and real with ourselves, with God, and with another person. To be completely free one must be totally transparent to at least one other human being. Confessing to God is the first critical step, but it is impossible to be fully known without human intervention. That’s the scary part. Satan steps in and tells you all the reasons (lies) why you can’t do this. But the Holy Spirit compels us in the opposite direction. Our God is a personal God, who communes His own being in three Persons working in absolute unity. Like the Father, Son and Holy Spirit, we must also work in unity. “A cord of three strands is not easily broken” (Ecclesiastes 4:12). To fully know ourselves we must be fully known. Shame, fear, denial, pride all stand in the way of being known — and all these shortcomings block the will of God. But with God’s help we can be free. If you need a confidential, experienced and compassionate resource to walk through your repentance issues, call Tom at House of Seven Pillars for a confidential appointment.